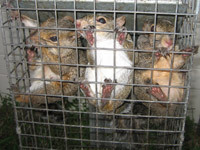 Five squirrels from one house. 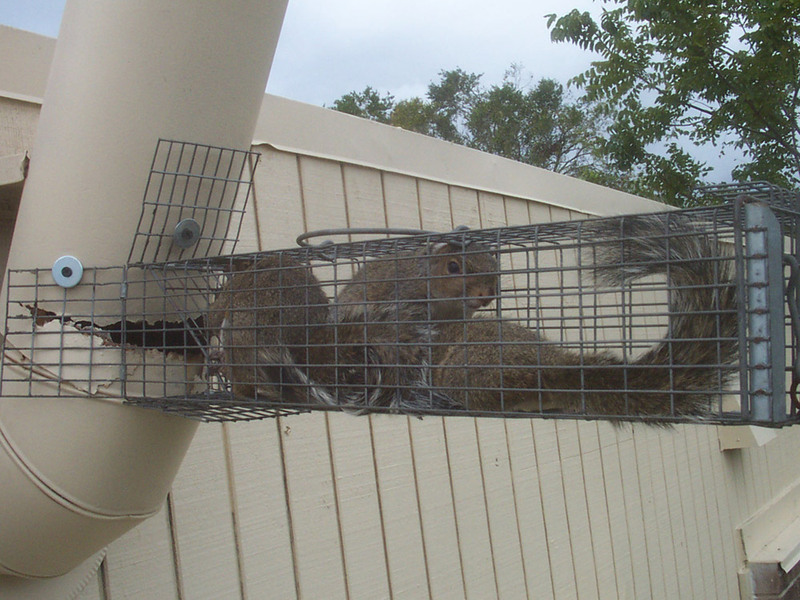 I trap them in humane cage traps. 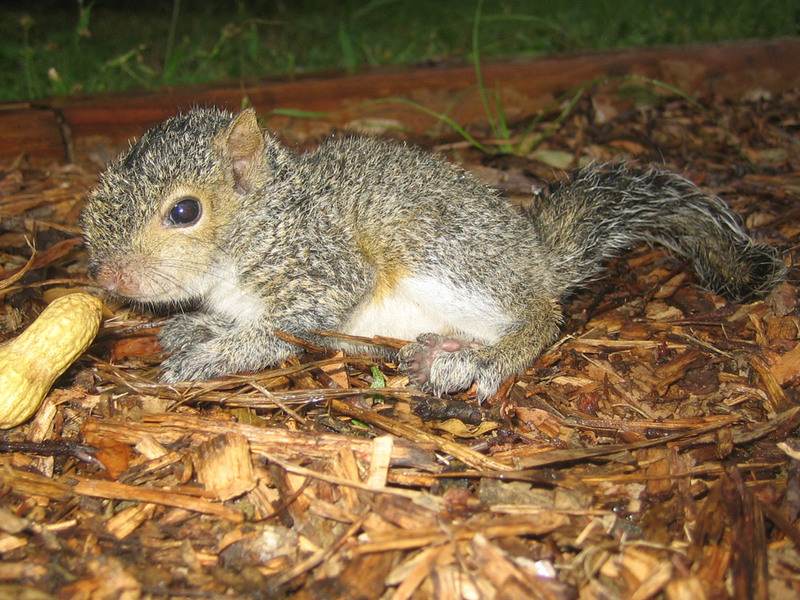 A mother and her baby squirrel. A fine day's catch of squirrels. 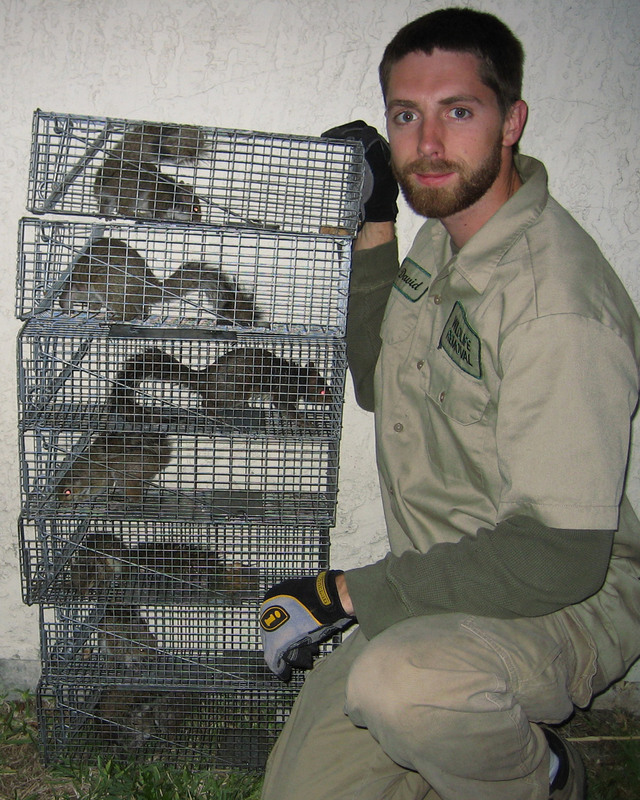 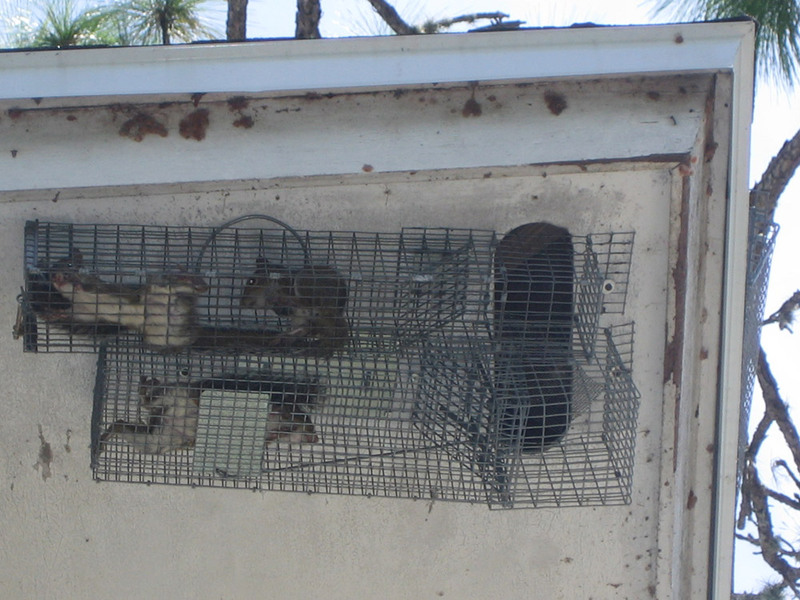 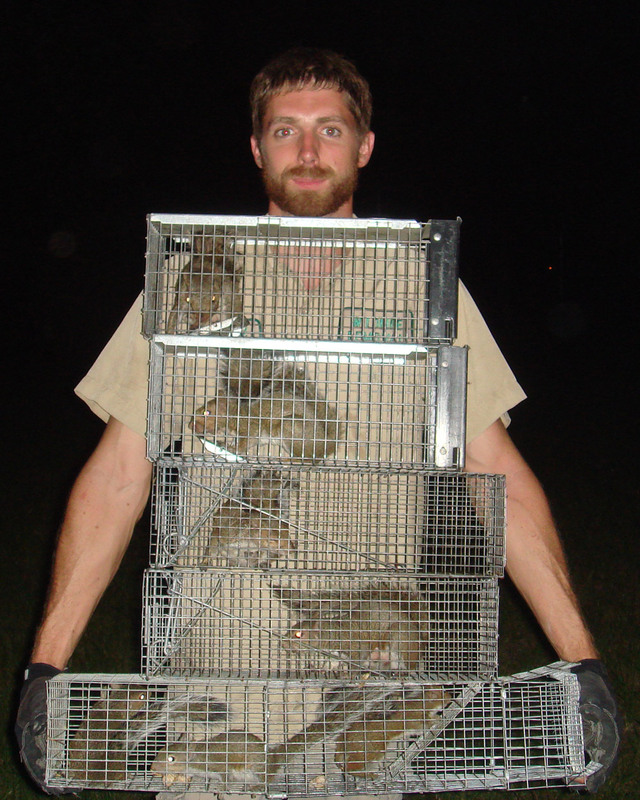 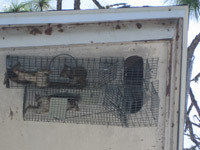 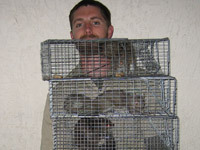 I caught mother squirrel in one trap, and her three young in a repeater trap below. 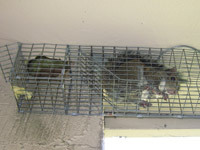 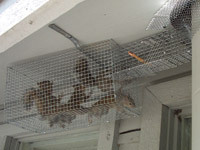 This trap mounts right on the soffit and catches the squirrel when it exits. Squirrels have to go out of the hole, and when they do, they get trapped. 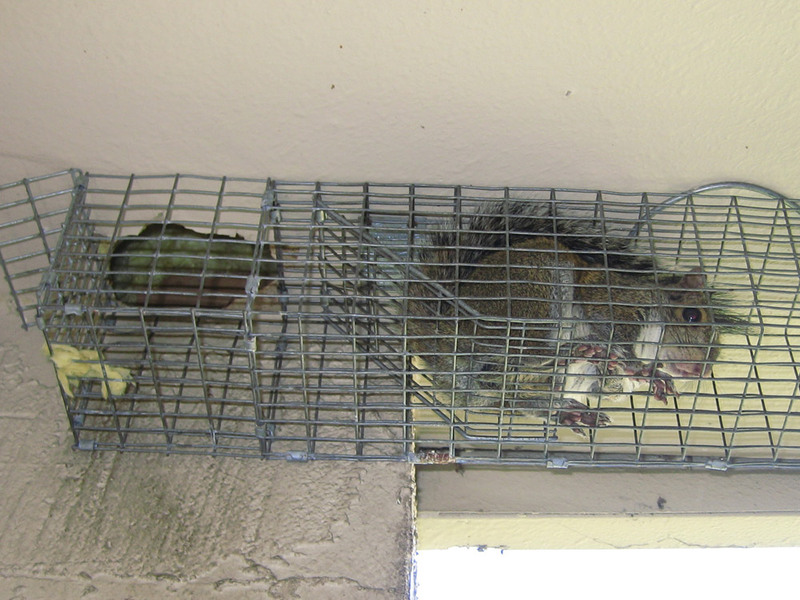 I caught these three at the same time, coming out of a broken pipe. 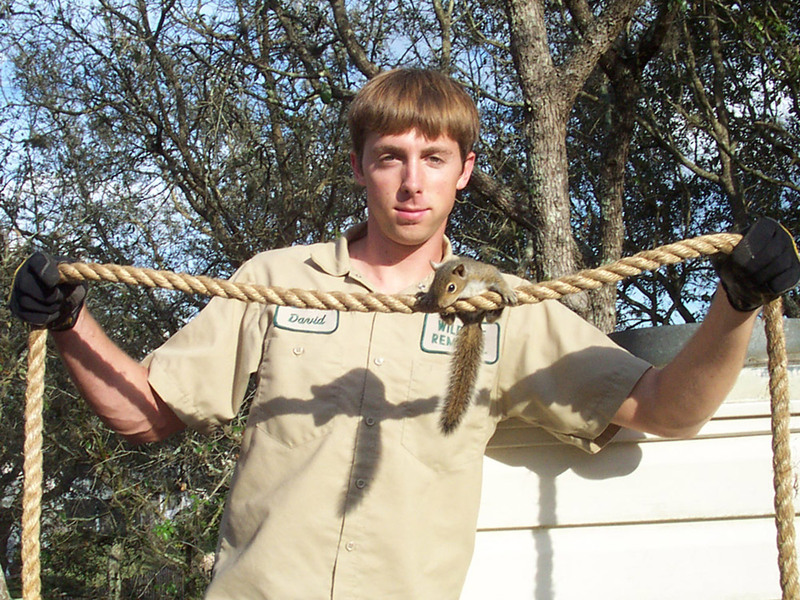 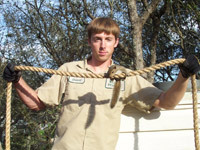 A juvenile squirrel fell down the chimney, and I used this rope to get it. 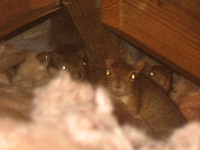 Here's a close photo - the young ones don't have the instinct to run away. 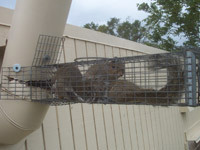 I often get them in groups, such as this ornery triumvirate. 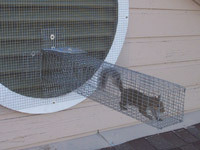 The Eastern Gray Squirrel is easy to trap - they're always looking for food. 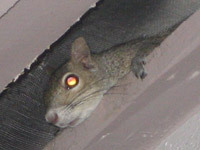 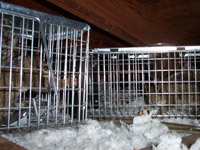 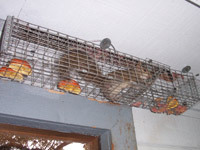 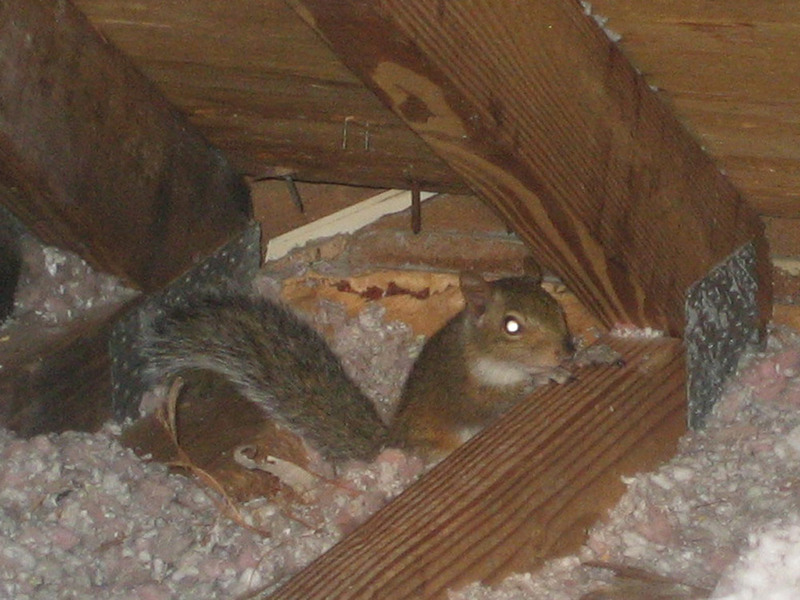 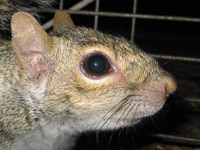 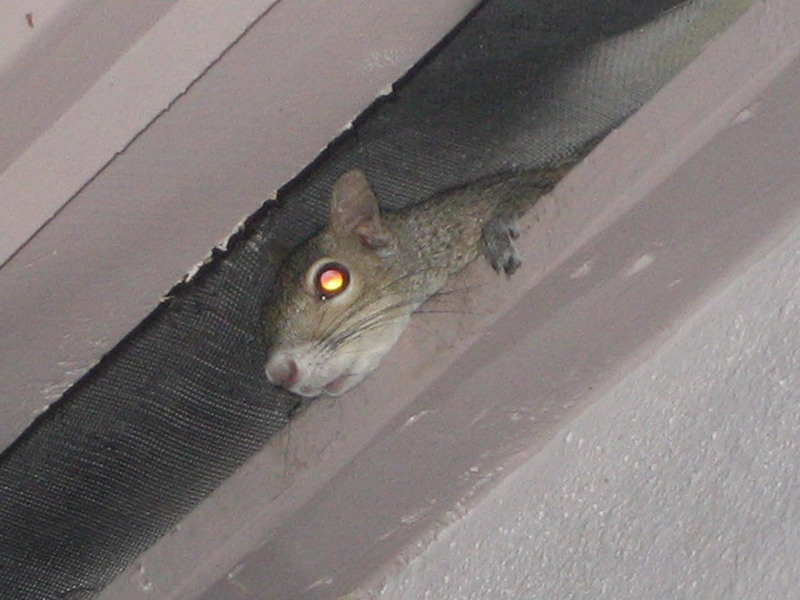 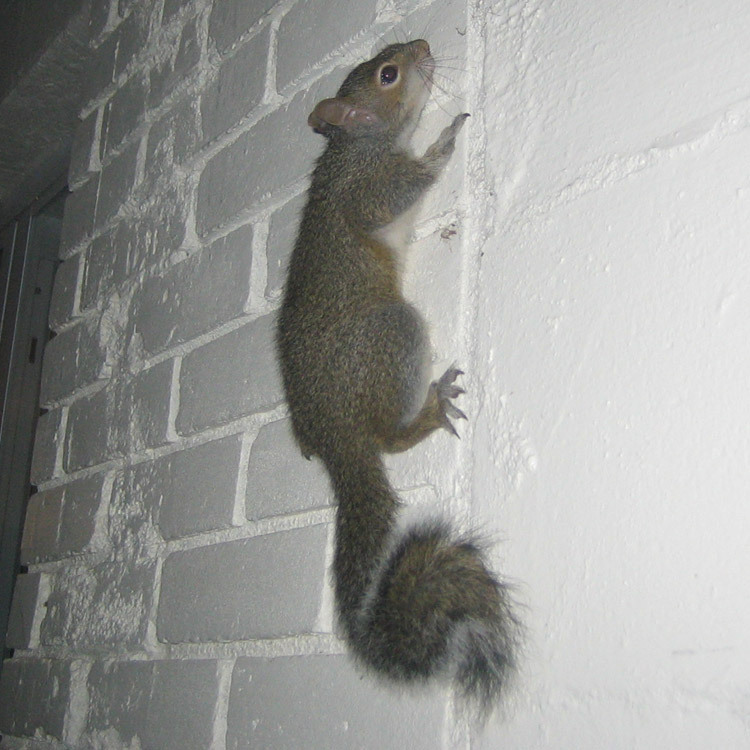 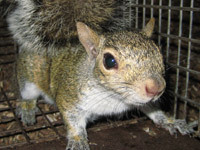 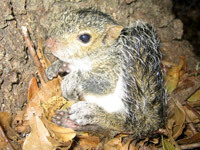 Squirrels often choose attics as home. 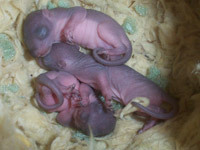 A mother often has a group of young inside. 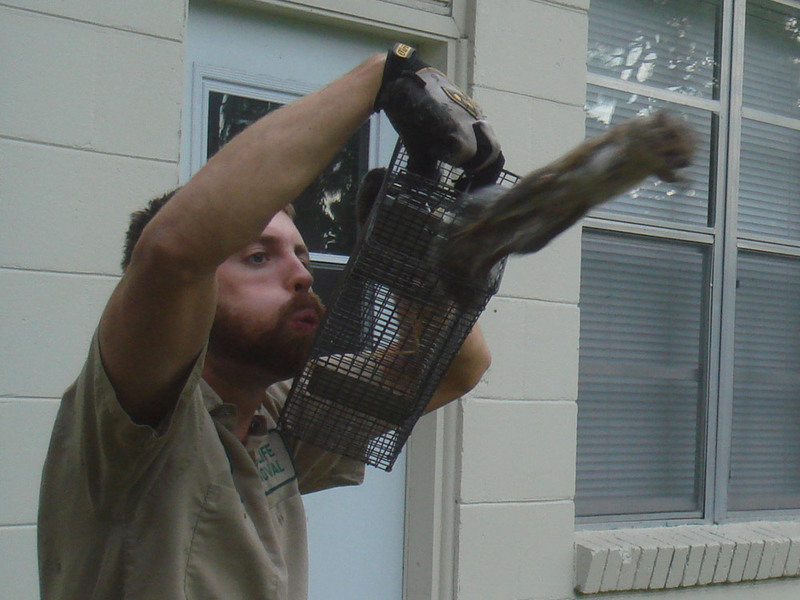 This flimsy screen is no match this one. 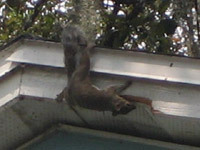 Squirrels like to chew on woodwork. 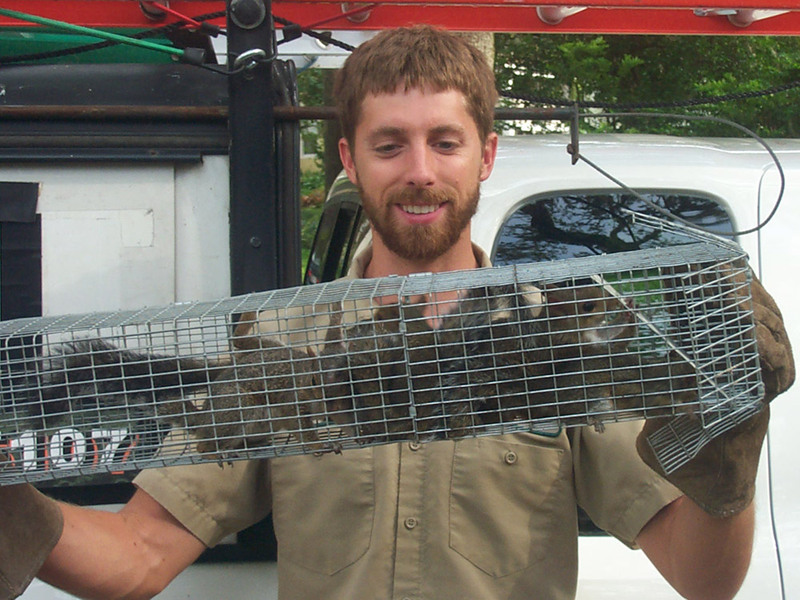 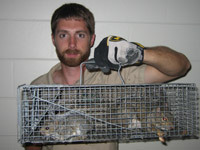 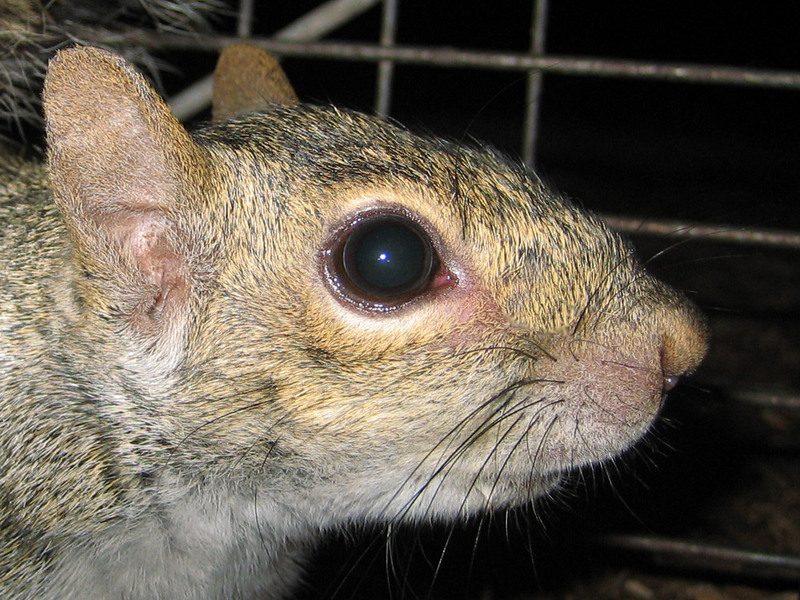 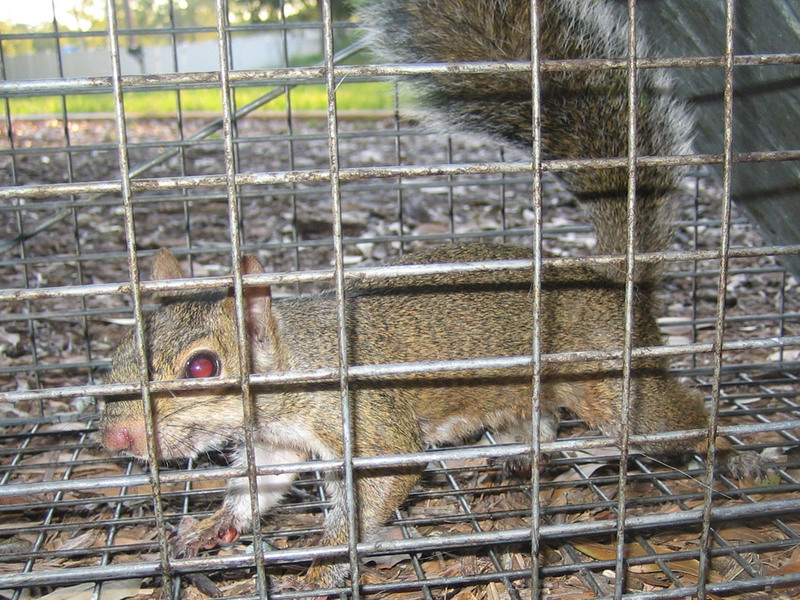 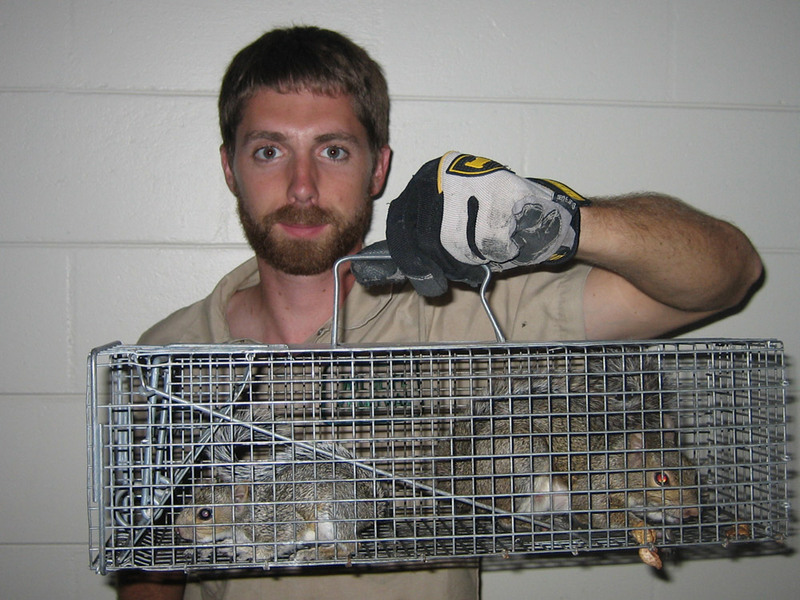 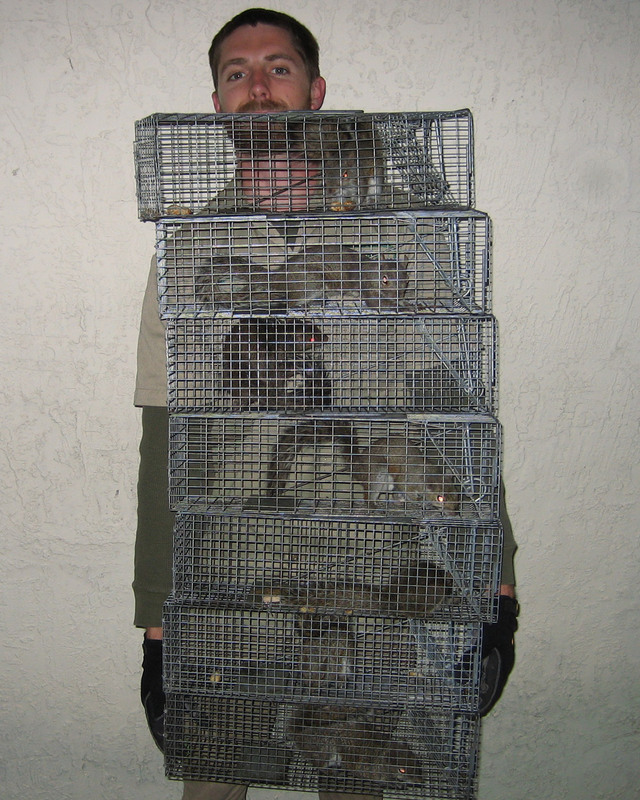 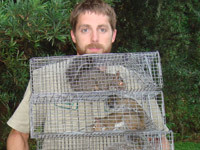 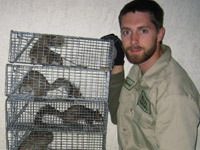 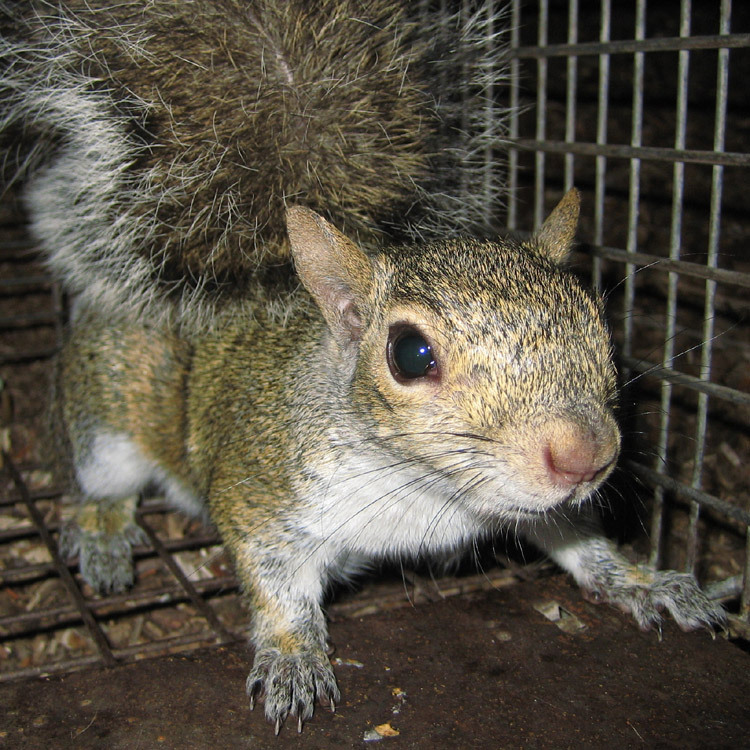 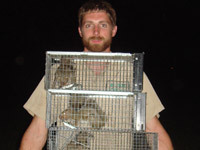 Sciurus carolinensis in a cage. 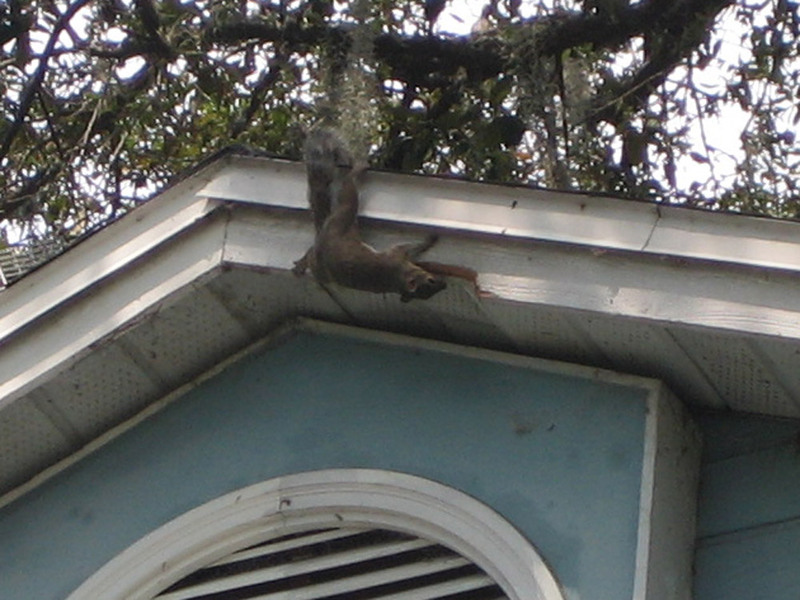 Detail photo of the profile. 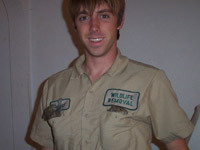 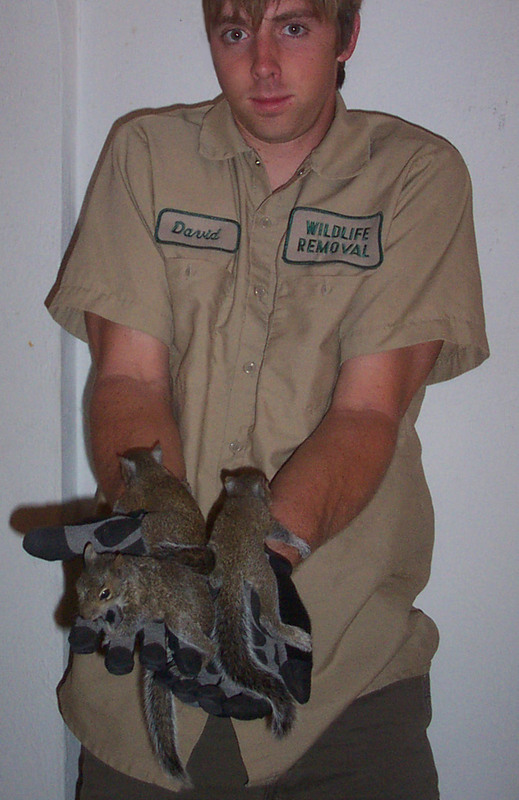 Baby squirrels in my shirt pockets. 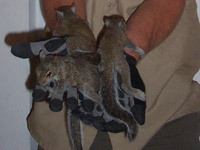 Three baby squirrels in my hands. 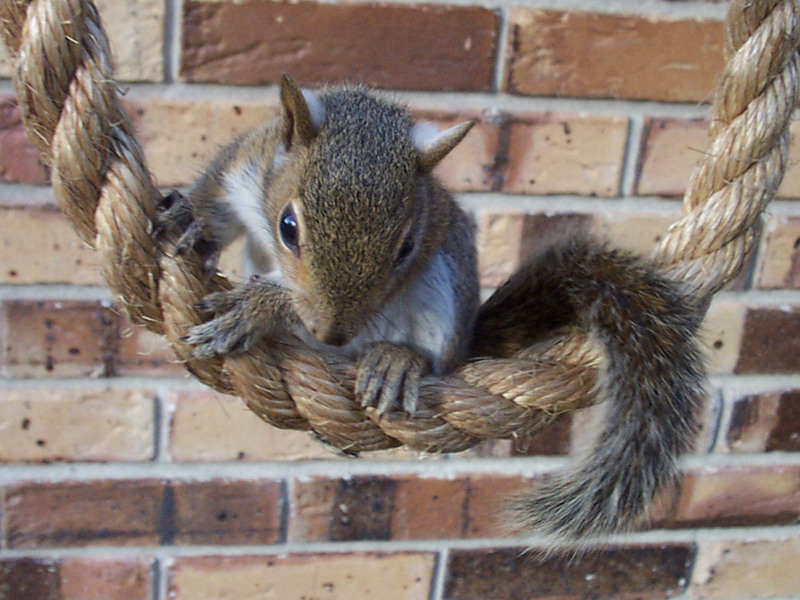 You're too little for that peanut! 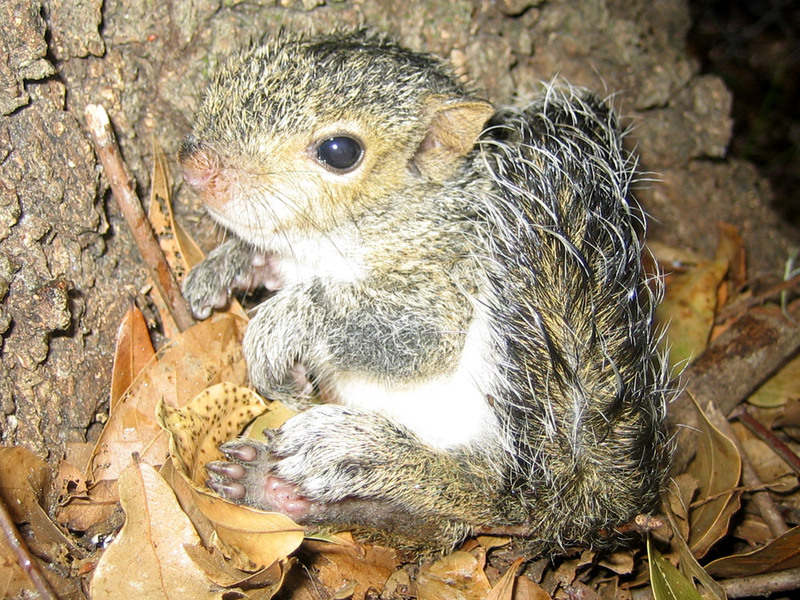 It's just the most darling thing. 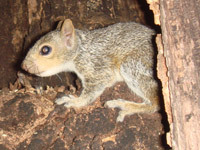 A young squirrel in a tree hollow. Three newborn squirrels in insulation. You can catch squirrels in traps mounted right on their exit holes. 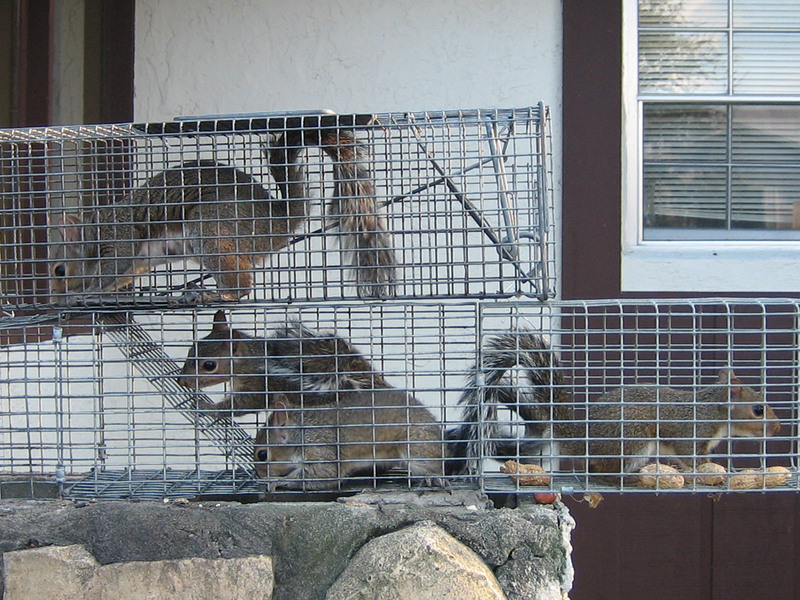 I got these four juveniles all at once in a single repeating trap. 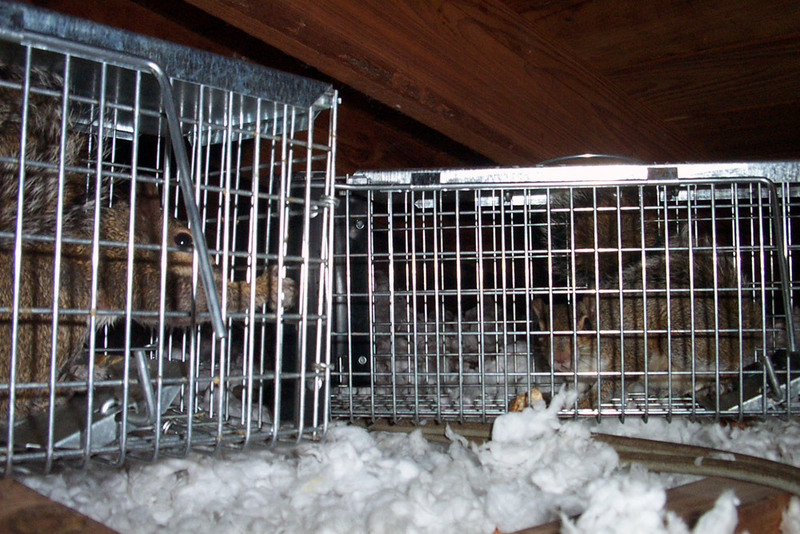 On rare occasion I'll catch them in cage traps in the attic. 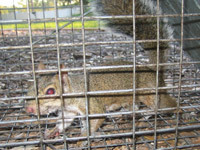 But it's usually more effective to get them when they come out of their holes. 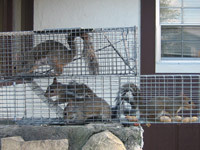 Four adults and three juveniles. 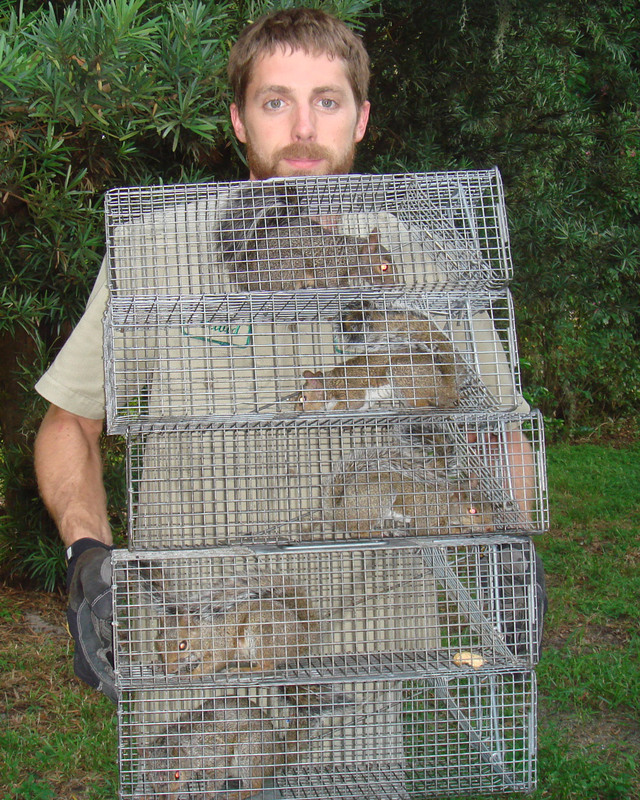 Six squirrels in one repeater trap! 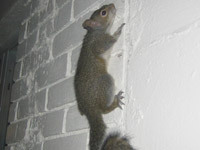 Climbing up the wall, into the attic. Blowing a squirrel to freedom!